Happy Saturday! We've got a crazy busy weekend here with kids' activities but I wanted to pop in here today with some links to new products that are tickling my fancy plus answer some reader questions. I loved the Memory Box Plush Dies that my friend, Jennifer, showcased in a video back in December. Well, guess what? Memory Box has some new spring-themed plush dies! These are fantastic for creating some adorable spring decor with felt and other goodies from your stash. My favorites are the Heart Pocket Plush Die and Egg Pocket Plush Die. I've linked to all the new release below in shopping. My friend, Mendi's, newest release of Sunny Studio Stamps and Dies is available. My favorites from this release are probably the Sending My Love Stamp Set and *Backyard Bugs (coming soon). I'll be sharing cards with these stamps in the coming weeks so please check back. Unfortunately quite a few of the new products sold out at Simon Says Stamp before this post went up (I'm so happy to see others loving Mendi's designs! ), however you can get on the wait list to be notified when they are back in stock at SSS. Memory Box Plush Dies. Affiliate links used. Sunny Studio Stamps and Dies. Affiliate links used. Q: I am LOVING the Ranger Archival Ink, but it stains the stamps terribly, and I just can't seem to get the ink off my clear stamps.... I've read everywhere that you can't use cleaners on your clear stamps without deteriorating them! I have no idea what to do? Is leaving this ink on for the most part an option? If not, what in the world are you cleaning the stamps with to not harm them? A: I am by no means a stamp cleaning expert but I use Ultra Clean Cleaner (says it’s safe for clear stamps) and the Stamp Scrubber Pad to clean my stamps and have never had any trouble with deterioration of my stamps. Some inks cause more staining than others but I guess that doesn’t bother me. Lawn Fawn is releasing a stamp cleaning at CHA this next week that I am anxious to try. Click HERE to learn more about it. Q: Loved your video on how you store stamps and dies in Avery Elle pockets. I am now in the process of doing this can you please tell me how you would store your red rubber stamps in those bags. Q: I was wondering if you ever made any videos of ideas on how to dress up the inside of your cards. I have a lot of trouble coming up with ideas on cool ways to do the inside and I'm just stumped. A: I am not the best at dressing up the inside of my cards so I don't have any videos specifically for that technique. I usually only add a small bit of stamping with an additional sentiment if I do anything at all. I generally leave them blank so I can write a note to the recipient inside. Q: I'm looking into getting another coloring medium for coloring in stamped images. I currently use prisacolor pencils and gamsol and am trying to decide between copics or the zig clean color real brush markers. Is the ease of use equally the same for both or one better over the other? A: Copics and the Zig Clean Color markers are two completely different types of markers so the results will be different with either one. Copics are high quality, long lasting (won't dry out for years and can be stored on theirs side or upright), non-toxic, refillable markers that come in 358 colors. They are alcohol-based dye markers, which means no matter how many times you color over an image, it will not cause the paper to pill. They give smooth results blend beautifully. These are artistic grade markers and can require a bit more practice to learn how to use them. I continue to grow and learn with them every time I color! Zig Clean Color Real Brush Markers are a water-based marker, great for watercoloring techniques. I highly recommend you use a watercolor paper or my favorite the Strathmore Bristol Smooth Cardstock when using these. Unlike Copic Markers, these will eventually cause the paper to pill if you go over the image too many times with the marker. You can use these with or without water. I love that they will blend seamlessly without the addition of water and it really sets these markers apart. The Zig markers are quite a bit cheaper than Copics but more expensive than other watercolor markers, however they can be used in multiple ways to achieve multiple looks. I think there is a bit of a learning curve with either type of marker, but the Zig markers are probably going to be a bit easier right off the bat than Copics. I know I didn't get to all the questions. I have more I will answer in another post. If you have a crafting question that you would like answered, please leave me a comment on this post and I will add it to my next Q & A session! Thanks and have a great weekend! Q: I have a question about die-cutting machines. i'm finally going to buy one and i'm leaning toward the sizzix. i have a bunch of dies that i've bought from lawn fawn. is this the machine for those? do you know if sizzix is compatable with stampin' up dies? also, which version of machine should i get? thanks for any assistance! A: I own and use the Sizzix Big Shot. It's compatible with almost all manual dies on the market (including Lawn Fawn and Stampin' Up). In fact Sizzix is the manufacturer who makes the Stampin' Up dies. There are several versions of the Big Shot. These are the two I would recommend. Q: Have you found a good way to store the paper dolls? Q: I must have those pens and cannot find them on your blog! MUST have!!! Can I get the name and sight to order from? Q: I have Silhouette Designer Edition software and am kind of confused on the new way to put into silhouette library. What are the exact steps you go through to put her files into Designer Edition? I thought I read somewhere to add cut lines and am So confused. A: Kerri has a great tutorial on her site showing how to import the files into the Silhouette Software HERE. Q: Your scrapbook studio and organization is amazing! I wanted to know if you've done any 12x12 scrapbook copies and if you have a scanner/printer or know a good place to get it done? A: I haven't ever had any copies made of my pages so I'm not sure where you might go to get it done. Sorry! Q: Came across the video describing your crafting room-- niiiice! I just have two questions: where did you get the flower frog to hold your cards for pictures and do you know of a place where you can still buy the craft mates pure binders. Thnx much for sharing! A: The flower frogs are from Etsy and if you click "My Store" under my blog header it will take you to Amazon where I've linked to the Craft Mates binders! HTH! If I didn't cover your question here, or if I've missed yours (my inbox is scary and I'm slowly working my way through it!) please leave it in the comments section at the end of this post and I will get back to you! Thanks! Q: What acrylic blocks do you use? A: My most often used (and my very favorite) are my Lawn Fawn Acrylic Blocks. I love the shape of the blocks (makes them easy to hold on to) and the grid design makes stamp placement a snap! Q: What adhesives do you use? A: These are the adhesives I reach for over and over. The Glue Glider is great when you want a permanent bond. You aren't going to be able to pull anything up without ruining something so be sure before you adhere! However, things stay put with this adhesive. The Tombow runner is a great basic dots tape runner. It is a permanent adhesive however there's a bit more "play" with this one and I've been known to pull things up with minimal damage if I need to reposition something. The Zig 2 Way Glue Pen is my "go-to" for liquid adhesive and attaching tiny tiny pieces to projects. Ranger Matte Medium glues dimensional (sequins, googly eyes, etc) embellishments with ease. It's also great to attach chipboard elements or anything that requires more of a bond than the Zig Glue Pen. Zots are my favorite way to attach small items without the mess of liquid adhesive. They're strong and come in lots of sizes. I use the medium, small and tiny the most. The tiny are perfect for attaching most sequins! Foam adhesive is one of my most used "tools". My favorite is the Scotch Double Sided Foam Tape. It is pricey but you get A LOT. I use it almost daily and I'm only on my second roll if that gives you any idea of how long it lasts! The American Crafts Foam dots have been in my adhesive arsenal for years. They are already pre-sized/cut and are super easy to use. Q: I would like to know what inks you would recommend for starter colors/brand for stamping of mama elephant and simon says stamp images. A: Ink color choices are a personal preference however I will give you my top few color choices in a couple of brands. I have found that Simon Says Stamp Dye Inks and Hero Arts Inks are very comparable in function and consistent wonderful results. You can't go wrong with either of them! Dye inks will dry very quickly and they tend to "fade" or lighten a tiny bit as they dry. Pigment inks are a great choice for solid stamped images or for using the Rock 'n Roll Technique to blend multiple colors on a single stamped image (you can purchase Kryssi & I's Mama Elephant Class showcasing this technique with pigment inks HERE). Q: I see you've got an addiction to the Julie nutting paper dolls too :) You mentioned you were going to use a 6x8 binder for your pages, may I ask what one you are going to use? Q: How do you attach your vellum to your cards as in the lawn fawn darling chit chat set? (Click HERE to see the project.) I tried to adhere just behind the clouds but didn't seem enough as looked like flopping off and then I did add just a few small dots to the dots underneath here and there and then the vellum kind of buckled or got wavy when it dried even though I used very little. I so love the look of vellum but can't get it to turn out the way yours does. A: I use little dots of Zig 2 Way Glue. Because it is a liquid adhesive, it does tend to make the vellum buckle so I sit something heavy on top of it until it dries (usually only takes a couple of minutes). I usually use acrylic blocks because they are weighty and I always have them lying around! Q: I absolutely loved watching your video of using the spectrum noir pencils on the lawmaker fawn critters, thank you for sharing. (Click HERE to see the project.) I also have to ask you what music were you playing in the background? Loved it too and would like to get the album. A: It is royalty free music I downloaded directly through YouTube. The song is Where I Am From by Topher Mohr & Alex Elena. Q: Can you give me the name of the adhesive you are using and a link of where I can purchase it? It's the perfect size. Q: However, I noticed that bazzil cardstock does not cut well. I think you have mentioned AC paper. Where do you get your AC paper? A: I have found that overall AC cardstock consistantly cuts the best. I used to get it from 2Peas and haven't bought any in awhile and now I don't see it anymore! I did a search and it looks like scrapbook.com is selling it. It does come in paper packs, not individual sheets. Q: How long will this offer stay up? 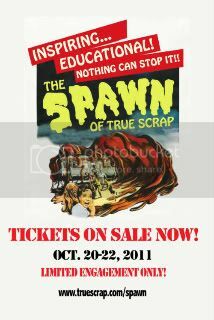 A: You can register for The Spawn of True Scrap until the day the event starts (October 20). I will offer the bonus class clear up until that time as well so if you are still on the fence or are needing to wait to sign up until a little closer to the event. No worries. I will honor all attendees who sign up through my link HERE. Q: I am actually going to be [out of town, etc.] during this event. Is it strictly a "live event", or can I do the videos/exercises the following weekend? A: It is not strictly a "live" event. You will miss any online live chats but the videos/classes will be available for as long as you want and those are the heart & soul of the event. The live chats with the instructors are just a fun bonus. In Lain's wording: "eternal access to class recordings and chat transcripts". Yay! Q&A: Silhouette Cutting Mats + the typewriter font I use. The most often asked questions I get via email or otherwise are regarding the Silhouette Cutting Mats and the typewriter font I use. My question for you is in regards to your cutting with your Silhouette. How often do you change your mats? I have the original sil and so I don't know if it's the same for you since you probably have the upgraded new version but I find my mats lose there sticky after just a few times :( Do you refresh your mats with spray or the zig 2 way pen or perhaps because you work with Silhouette you get an unlimited amount of mats sent to you ??? Any tricks or tips for me....I find I don't use my Sil as much as I could because it's like hoarding it for good projects. First, I feel like I should probably address that I am no longer affiliated with Silhouette in any way so I don't get anything from them. Anything I share regarding cutting with the Silhouette Machine or the designs I use is shared because I truly love die cutting with this tool and I actually purchased the designs. I won't share anything here regarding the machine unless I really love and use it. I loved my Silhouette before working with them and I still love it now. I only use the thick media cutting mats. They are ultra ultra sticky to begin with (almost too sticky) but I find they hold my paper better than the thin media ones. I only change my cutting mat about every 2-3 months. I use mine on almost every scrapbooking project so I feel like I get a lot out of the cutting mat during that time. The cutting mat does lose it's super stickiness after awhile, however it will should still hold your paper in place. It will not look clean and new but it should still hold your paper. You can always use spray adhesive if you feel like you need to but I never do. Once my paper starts moving during cutting or the cuts aren't clean, I throw the old one away and get a new one out. Same with the blade. If I have changed cutting mats and the cuts are still not clean, it's time for a new blade. The font is Typenoksidi. You can download it HERE. Q: What kind of paper did you use. I'm thinking the bazzil cardstock might not be the way to go since it is textured, I'm not sure it will print properly. Is here some thing in particular you like and where do you get it? One: when you print the images on cardstock they are more muted and not as vibrant because the ink is absorbed into the cardstock. *I have tried the Print & Cut on cardstock and it does print and cut exactly like on the photo paper. I just like the vibrant color that photo paper provides. I purchase all my Epson supplies at the Epson Online Store HERE. Q: Do you have to buy the ink or it already comes with it? Q: Will this work on a mac? Do I need to download new stuff? A: (this is from Kerri Bradford) "You can totally use the images for Mac, IF you use that parallel program that runs Windows on your Mac. With it setup that way, you can totally use the Robo Master software along with all it's wonderful image glory!" I have an iMac and use it for everything...except my Silhouette. I still run it on my old PC laptop. I have considered trying out the Bootcamp program that comes on the Mac that makes it possible to run Windows on a mac but haven't taken the plunge yet. I will definitely post about it here when I do. Want to learn about Bootcamp? Click HERE. Q: I own the Silhouette but not the Sihouette SD, will the program look the same on it? I noticed you have different cutting mats, do I have to have the same ones to print and cut? A: I own the original Silhouette, too. :) The images will work on both models. A: You can use either style of cutting mat but I do think the newer style (clear mat) works better than the older style. That has been my experience, anyway. Q: Do you use the Sillouette or the Sillouette SD? Which would you reccomend purchasing? Also, where do you purchase your downloads that you use? A: I have the Original Silhouette. Because I don't take mine with me to scrap it works for me and I don't currently have plans to purchase the SD. However, I think if you like to take your supplies/tools with you to a crop or to scrap with a group of friends, the SD is a great choice because you can use it without a computer. HERE is more information on the SD model. A: The downloads are all purchased through the software that comes with the Silhouette or Silhouette SD. HERE is more information on purchasing and downloading the die cut images. Q: I was wondering after you download the print and cut designs they no longer have a 'p' by them how do you remember which ones are print and cut? Also do you always cut twice? A: (This suggestion comes from Kerri Bradford and is also what I do to keep my P&C's separate from the rest of my designs). "I would suggest creating a folder of just Print & Cuts, select all the P&Cs that you've downloaded, and drag them into your new folder. Other than that, when you click and place it in your document, you'll immediately be able to tell which ones are P&Cs because they will be in color, whereas the regular diecut images will just be an outline." You can create folders in your "My Library" in the Craft Robo software to make it easy to find designs. Q: I was wondering, can you customize the print and cut images as far as color? (This comes from Erin Bassett) "Wanted to mention that to resize images in the RM software I right-click on the image & then click on "position settings"...I then put in the size I want it to be & usually tell it to hold the aspect ratio so the image doesn't get distorted." Q: Since you use the Silhouette a lot, I was wondering if you would recommend purchasing a Silhouette even though I already have a Cricut Expressions. I love my Cricut but I am really liking all the cute images and designs that the Silhouette has. I was just wanting to know your opinion on if I would use it to get my money's worth out of it since I already have a Cricut. Also, do you feel limited by the paper size as it isn't 12 x 12? A: I purchased my Silhouette first and that is the machine I am most passionate about (but I do have a Cricut as well). Confession time: I only bought the Cricut because I wanted to use the Graphically Speaking cartridge. I really have only used the Cricut with that one cartridge and I admit the 12x12 cutting size IS a nice plus. However, I don't really mind not having the 12x12 option on the Silhouette. The gal who designed Graphically Speaking for Cricut (the talented Miss Kerri Bradford) is actually working for QK Silhouette now designing their digi download designs which makes me SUPER happy. I can use ALL the fonts on my computer, no extra software needed. QK releases new digi designs twice a month (and there are a lot of them to choose from for purchase) and the designs are absolutely amazing. I can design my own shapes for cutting. Welding script fonts for cutting is SO easy (and with the new welding feature you can weld other fonts/shapes as well). Q: I just wondered how do you apply intricate cuts like that to your page, adhesive, Xyron? A: I do use my xyron sometimes but I really like Krylon Spray Adhesive. Q: I don't have a Silhouette... yet, but I am curious about the downloads. Where can I read more about it? How much they cost, what they look like, etc. A: Check out this website HERE. It's still relatively new so I think it's still under a bit of construction. HERE is a bit of info about the downloads. Q: I have a question for you...when you use the Silhouette, what kind of cs do you use? A: Anything and everything. Stampin' Up Cardstock, Bazzil, American Crafts, etc. The key to getting a good cut with cardstock is to change your media type setting to Index 90 (you will need to use the pink cutting tip). Sometimes I will cut the design twice (do not remove it from the machine in between cuts). It also helps to have a clean cutting mat (although I don't replace mine nearly often enough and don't have too many problems). And here's a few other random questions & answers regarding recent projects. Q: Could you tell me where you got the tape dispenser with the glue dots on it? A: HERE it is. LOVE this thing! Q: i feel like i've searched everywhere for the foam app from tim holtz but all i can find are the felt applicators. would you mind telling me where you got yours? A: HERE is the tool and HERE is the foam refill. Q: Could you share where the corduroy button is from, I've been on the hunt for those forever! A: They are from Stampin' Up! And I see that they have a couple new colors available for a limited time. Yay! The new Garden went up on the first of May at 2Peas and this month's theme is die cutting (yes, I was SO excited about that!). I love the new circle die cut border...so fun! The circle border, scallop border and title was all cut using the Silhouette. The flowers are Cookie Cutter dies for the Revolution. Click HERE for supply list and more info. Click HERE for more info and supplies. And here's a couple of fun projects from NSD. The alpha borders were cut using the Silhouette and the matted part of the layout is all adhered with pop dots for dimension. First I had a few questions + answers that I wanted to share here this morning. Q: Where do you purchase your kraft cardstock. A: I have been buying all my kraft cardstock at Hobby Lobby. It comes in a 25 sheet pack, I think, and it's cheap and the perfect "kraft" color. Q: I was just wondering, do you have to use the Big Shot die machine for the Bigz dies? A: Yes, they are. HERE is a link. I stamped them once on the background and then on several sheets of patterned paper, then cut the individual pieces from the different papers and glued them over the first stamped image. do stuff today album inside cover. christmas album inside cover (painted). A: They are from the 5th Avenue Collection which isn't new so I'm not sure if they've been discontinued or not. I did find a few in stock HERE. I have ordered from here several times (I get all my We R leather albums here). Q: Can the goosebumpz be used in either the Big Shot or the Cuttlebug? A: Unfortunately, I did try the QK goosebumpz with the Sizzix Big Shot and I wasn't very impressed with the impression it left and the goosebumpz didn't work at all with the CB. :( Sorry. However, if you have the Big Shot and are looking for some great embossing products check out these new texture plates from the new Stampin' Up catalog. Today is February the 5th so that means it's time for a new class layout, sketch, PDF handout and video for my class Celebrate the Seasons over at 2Peas. Click HERE to see more of the layout, the sketch, PDF file download and how-to video. HERE is the link to the Education Board post where you can ask questions, share links to your layouts and more. And HERE is a link to the GG Blog Post about this class with some additional ideas for creating your layout! Okay, I have a BIG project I'm working on for THIS new class being offered by Shimelle at 2peas. One of Chad and I's favorite hobbies both as a couple, individually and as a family is to travel and it's a huge part of our life. I am so excited to be able to have a place to record everything about our HERE, THERE and EVERYWHERE. If you love Shimelle's Journal Your Christmas class every Christmas season take a look at this new workshop. I am providing one of the sample albums for her class. So fun! Lots to do so I better get busy! Click HERE for supply list and details. Q: I love what you did for your first 3 weeks (of Project 365) and i'm dying to see that twilight addict page! Q: What scanner do you use? A: Epson Perfection 2580 Photo Scanner. I have had it for a couple of years now and it works great. It also scans in film negatives which is great for people like me who have made the switch to digital but still have some older photos that are on film that you want to manipulate or work on in PhotoShop. This model is discontinued however here is the newer model that looks similar in style and function: Epson Perfection 4490 Photo Scanner. Q: How are you printing on your journaling cards (for Project 365)? A: I am feeding them through my printer. I set up templates for both the small journaling cards and the longer ones in Microsoft Word and then I just type up my journaling and print. I do adjust the margins, etc. a bit for some of the journaling cards and I find that my printer prints straighter on larger paper so I apply a tiny bit of adhesive to a plain piece of printer paper and temporarily adhere the journaling card to the plain paper to feed through my printer. Q: Do you use rub-on's for the date at the top (for Project 365 weekly date cards)? A: I am using a Heidi Swapp date stamp but rub-ons would work as well. (The date stamp is a couple years old, not sure if it's available any longer or not, sorry!) You could also set up a document in a word processing program to print the date on the cards. Q: I saw your video of the album you did using CTMH products of your son with baby photos. The one thing I really wanted to know how you did was the words you have written on the photos you used in the album? Click HERE to see the album in question. 1. I opened my photo in Photoshop and changed it to the desired size. 2. Open one of the overlays in Photoshop and change the size to fit my photo. 3. Then just drag the overlay directly over your photo and move it around to your liking. 4. Flatten the image and print. Q: Can you tell me the difference between a revolution and the big shot? Do you need a long platform for the big shot to do the 12 x12 stuff? A: The biggest difference between the QK Revolution and Sizzix Big Shot is that the Big Shot will cut a wider variety of dies from OTHER manufacturers which makes it more versatile, in my opinion. The Revolution's platform is only 4" wide and the Big Shot is wider and will take wider dies. Unfortunately, I don't *think* that the Big Shot will accept the 12" border dies from QK. I don't think I have tried that yet so I can't tell you for certain. I would assume you could cut a portion of the border but not the whole thing. I will try to test that out later next week so I can give you a more informed answer. You do need the 12" platform with the Revolution to cut the 12" border dies. If you want to see how the Big Shot accepts other QK dies and Cuttlebug dies and embossing folders click HERE. Q: I was wondering what are the plastic containers you are using to sort your flowers? Click HERE and HERE to see my storage. A: The brand is Plano. I purchased mine at my local Wal-Mart and found them in the sporting goods section with the fishing tackle boxes. I believe you can order them online too, but not sure where. Maybe try a search for Plano clear storage boxes if you can't find them locally. Q: Where are the plastic storage containers you use for your large chipboard and felt, etc. from? A: They are from the Container Store. HERE is a link. Going to play a little Saturday catch up here. Hope everyone is enjoying their Saturday. I am working on THIS today. My kit came a couple of days ago and I printed my daily photos (from the 28th of December to the present) out yesterday afternoon and now it's time to add some journaling and fun stuff. :) I'll share a page or two soon. Also, Chad and I went to see Gran Torino last night. Clint Eastwood at his best. Seriously. Probably one of the best movies I have seen in awhile. I don't have a single bad thing to say about it. So good. Q: Would you please tell me what paper cutter you use? A: I use the Fiskars 12" Rotary Paper Trimmer and LOVE it. Q: Just wanted to thank you for the hours I have been able to spend looking at your posts (especially storage and videos). Is there a way for me to subscribe for e-mail notifications other than typepad? A: I don't currently have a newsletter subscription but you can sign up to be notified when I post a new video on youtube by going HERE and clicking the yellow 'Subscribe' button. A: It is a digital overlay by Ali Edwards, Loving Life Word Art. HERE is a link. Q: I was wondering what you used for cutting out the bird in THIS post? A: I used the Quickutz Silhouette. It's from a digital design CD that I don't think is available anymore but if you have the Quickutz Revolution, Cuttlebug or Sizzix Big Shot you can use THIS die and get a very similar bird. :) If you are a Silhouette owner, THIS bird is super cute and very similar too. Q: I have tons of SU wood mounted rubber and have been unmounting them, but am not happy with what I am doing. Do you have any suggestions for them? Q: Seeing how you used the big shot, I'm presuming I could use the same dies you used in the Cuttlebug? I'd often wondered about the bigger QK dies and the Cookie Cutters but having seen your video I don't see any reason why I couldn't use them in my Cuttlebug. A: I did use quite a few digital elements, either on the photos or printed directly on cardstock. As for making it fit, it was mostly trial and error. I would print it on regular, plain paper first, make any adjustments necessary and then adhere the journaling spot, etc. to the plain paper and feed it through my printer. All the digital elements I used were by Ali Edwards for Designer Digitals. The photo collage was made by creating a 4x6 background in photoshop, then I just resized my photos to fit within that size. All the photos are either 1"x 1" or 1"x 2". Q: I was just looking at your Christmas journal, I was wondering how you put the letting on the pictures? Like where it says Seasons Greeting, Merry and Bright, Hello Santa. Is that a program you use and print them with the picture or are they a rub on/sticker? Q: Love this Christmas album you completed -- wow. What font did you use throughout the album (the simple printed one)? I really like it and I noticed you use it frequently.